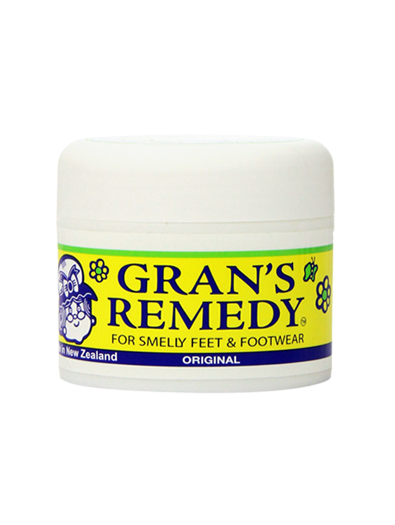 We here at Gran’s Remedy have developed the cure and answer to put an end to your foot odor dilemma and bring your confidence back. Unlike other products out there that just temporarily mask over the smell, our powder actually treats the source of the odor and eliminates the bacteria and fungi known to cause smelly feet and footwear. Click the Add to Cart button below and get yours and more for your friends and family in need today! 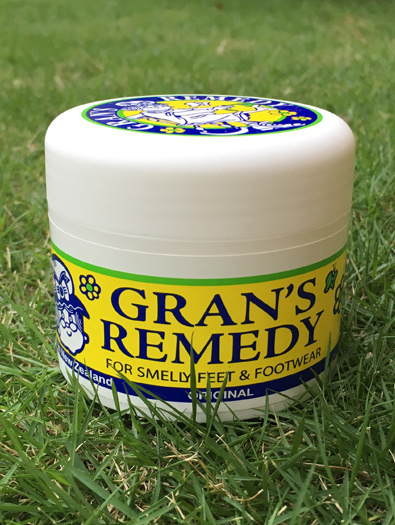 To help you curb the often embarrassing stinky feet that become a problem in the warmer months, try Gran’s original foot powder. Unscented, this is the invisible and productive way to get rid of that pesky odour without adding anything. While scented foot powders are great, there is a lot to be said for the traditional scent-free ones for those who prefer them. Best of all, this is easy to use. With the included spoon, scoop the measured amount into each shoe and continue for a full week, or until you reach the end of the tub of the powder. This will provide your shoes with up to 6 months of protection from odour, and your socks and feet will benefit from it too. Don’t be afraid to use this in all of your different shoes so that you can enjoy the lack of stink in all of your footwear options. You may not think that it’s going to make a difference, but once you try it out for yourself, you’ll see that it really does help. Perfect for putting the best (stick-free) foot forward. 1) Give the container a quick shake before use. 2) Carefully remove lid to avoid spilling. 3) Use about 1/2 a teaspoon of powder and place inside each shoe. 4) Use for 7-10 consecutive days or until the powder is used up. 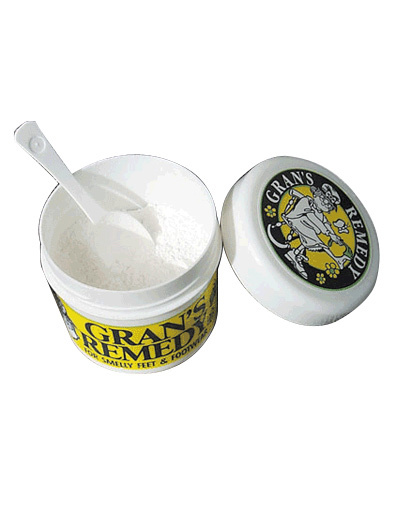 5) Let Gran’s Remedy do its magic and have your feet and shoe(s) smelling fresh again! We try our best to get orders out immediately but please allow 3-5 business days from when your order is placed for delivery. Once your order has shipped, you will receive a shipping confirmation via e-mail with a tracking number. Gran’s Remedy performs rigorous testing to ensure the efficacy of our products and believe that the products will become the ultimate solution to your foot and shoe odor dilemma. More importantly, our products have been clinically proven by the University of Otago showing that Gran’s Remedy is the only tested product that effectively destroys all 5 of the bacteria, which are responsible for causing feet and shoe odor. If you do not have a positive experience for any reason, we will do whatever it makes to make you are completely satisfied with your purchase. Buying items online can be a daunting task, so we want you to realize that there is absolutely zero risk in buying and trying it out. If you do not like your purchase – no worries, we will make everything right. That’s why we offer a no questions asked money-back guarantee policy. For further inquiries, please go right here and we will answer any questions or concerns you may have on your mind in a timely manner.